Small jar - food sticks for all pond fish & koi. Analysis: Protein 28%, Oil 6%, Ash 4.5%, Fibre 2.5%. Contains vitamins to maintain fish health and spirulina to promote colour. Big jar - food sticks for all pond fish & koi. Contains vitamins to maintain fish health and spirulina to promote colour. 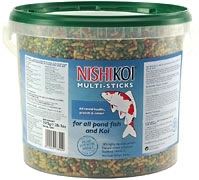 Small Bucket - food sticks for all pond fish & koi. Contains vitamins to maintain fish health and spirulina to promote colour.